RALEIGH, N.C. (AP) — Mark Barberio can finally get a haircut. 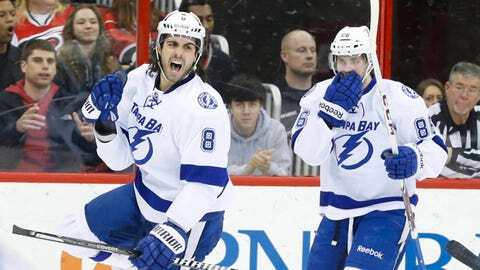 The Tampa Bay defenseman scored his first two career goals, and the Lightning beat the Carolina Hurricanes 5-3 on Sunday to move into a tie for first place in the Atlantic Division. Barberio promised himself as a minor leaguer two years ago that he wouldn’t cut his hair until he made it to the NHL and scored there. Now it’s time for those shoulder-length locks to come off. "I was just going to let it grow, and I think it’s gotten a little too long," Barberio said. "It’s got to go, though," he added. "I made a promise." Ondrej Palat had a goal and two assists, and he and Barberio scored 1:23 apart during the Lightning’s three-goal first period that also included a goal from Nikita Kucherov. Teddy Purcell also scored to help the Lightning pull even with Boston atop the division. "I’m sure they were frustrated," Bishop said, "but that’s what you’re supposed to do." "A lot of what we wanted to do was throw pucks at the net, attack," Staal said. "All those goals that can deflate you, they capitalized on. We didn’t sulk or cry. We continued to work and compete and had a lot of other chances and fought hard to try to get back into it. Just was a little too big of a hill to climb." Justin Peters gave up three goals on seven shots and exited with 4:53 left in the first. Anton Khudobin finished it by making 15 saves for the Hurricanes, who have lost three of four since a season-best five-game winning streak. They made this one interesting midway through the second, with Semin and Staal scoring 3:54 apart to cut their four-goal deficit in half. But Barberio followed with his second goal, a one-timer that beat Khudobin with 11:48 left in the second to put Tampa Bay up 5-2. Hainsey pulled the Hurricanes back within two goals by ripping a rebound past Bishop with 13:46 left in the third, but Bishop held off the Hurricanes the rest of the game. "It felt like we were coming back on the attack," Staal said. "And then they turned around and took the momentum back with a goal." The Lightning continued their dominance of their former Southeast Division rivals, sweeping the three-game season series while winning their seventh in eight meetings and sixth in a row in Raleigh. "I don’t think we had our best game tonight," Barberio said. "Carolina was really on top of us, as you can see from the shot total. But sometimes you need your goalie to come up big, and (Bishop) did it again." And that three-goal first certainly helped. Tampa Bay, which entered having scored a power-play goal in four straight games, wasted little time extending that streak to five by converting their first chance at 6:09. With Riley Nash in the box for tripping, Barberio slipped through the back door, took a pretty backhand, cross-net feed from Ryan Malone and pushed the puck past Peters for his first goal. "I just had to throw it in the net," Barberio said. Palat made it 2-0 by beating Peters with a one-timer on a rush at 7:32, and Kucherov sent Peters to the showers at 15:07 when he put a wrist shot past him. NOTES: Carolina defensemen Justin Faulk and Andrej Sekera were on the ice for all five Lightning goals. … Tampa Bay RW Martin St. Louis, who assisted on Palat’s goal, extended his point streak to eight games. … Carolina C Manny Malhotra skated in his 900th career game.